Summertime and school holidays are the cue for city dwellers, and landlubbers in general, to pack their bags and head down to the coast. For most people one week a year is all they experience beside the seaside, and this relative lack of experience can sometimes prove a headache for the lifeguards who patrol the water’s edge in case anyone gets into difficulty. Children, in part because of their natural enthusiasm and curiosity, are one of the biggest risk groups for accidents on the beach. So it is important that educational schemes such as the Junior Baywatch scheme on Lusty Glaze beach in Newquay, Cornwall have been created specifically to address this problem. Anything that can help people have a safe time in the water and at the beach is the philosophy behind the scheme, created five years ago. Tom Christopher, operations manager at Lusty Glaze, is backed up by a team of qualified beach lifeguards, trained to the standards required by the Royal Life Saving Society. As well as Junior Baywatch, aimed at children from eight to 14, the Adventure Centre offers a Baywatch Babes programme for three- to eight-year-olds. Both promise a mix of fun and education and aim to instil in students an understanding and appreciation of the natural elements. “Junior Baywatch is aimed at developing their knowledge of the sea so they can enjoy it safely; developing their knowledge of lifeguards and how they operate, so where to go if they need any help, what to do if they see somebody in trouble, and that’s all incorporated with some fun and games,” says Tom. Flagging up the potential of the sea and the possible dangers faced by anyone who underestimates its power is a test for the instructors. They have to ensure the safety message gets across without scaring the children into thinking the sea should be avoided. How do they strike that balance? “By making it fun and showing them how much fun the water can be. And what they need to do to have that fun safely,” says Tom. Classes can range from groups of two or three to parties of 40 or 50. As well as children holidaying in Cornwall, local schools use the programme as an activity day. 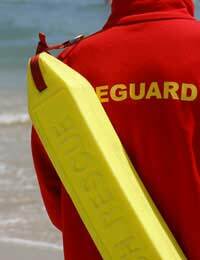 Every child is given a wet suit and receives instruction where appropriate in the use of lifeguard equipment. The Junior Baywatch programme runs on a book-by-book basis, rather than at set times or on particular days, so parents visiting Cornwall this summer should contact the Adventure Centre in advance. For other coastal resorts it is well worth asking the local tourist board whether a similar scheme is available. Not only will your children have more fun beside the seaside but they will return home with a greater appreciation of the sea, and an understanding of how to interact with it safely.